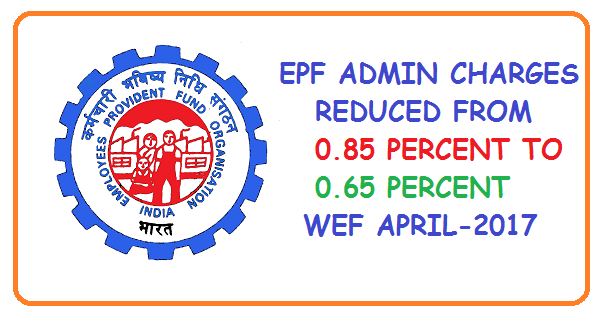 EPFO has issued a notification dated 15.03.2017 under which EPF admin charges has been reduced to 0.65 percent from 0.85 percent earlier. Earlier EPFO had reduced the charges from [1.10 percent to 0.85 percent] from 01.01.2015. The new rate of 0.65 percent is applicable on contribution for the month of April-2017 ,so you have to pay 0.85 percent for the contribution of March-2017. Any establishment in which less than 20 employees are employed. (a) Jute (b) Beedi (c) Brick ( d) Coir and (e) Guar gum Factories. ## Contribution is rounded to the nearest rupee for each employee, for the employee share, pension contribution and EDLI contribution. The Employer Share is difference of the EE Share (payable as per statute) and Pension Contribution. !! Monthly payable amount under EPF Administrative charges is rounded to the nearest rupee and a minimum of Rs 500/- is payable. $ $ Monthly payable amount under EDLI Administrative charges is rounded to the nearest rupee and a minimum Rs 200/-is payable. @@ In case Establishment is exempted under PF Scheme, Inspection charges @0.18%, minimum Rs 5/- is payable in place of Admin charges. In case the Establishment is exempted under EDLI Scheme, Inspection charges @ 0.005%, minimum Re 1/- is payable in place of Admin charges. The contributions are payable on maximum wage ceiling of Rs 15000/- by employee and employer. The employee can pay at a higher rate and in such case employer is not under any obligation to pay at such higher rate. For an International Worker, wage ceiling of 15000/- is not applicable. Contribution is payable out of the employer’s share of PF and no contribution is payable by employee. When an employee crosses 58 years of age and is in service (EPS members ceases on completion of 58 years). When an EPS pensioner is drawing Reduced Pension and re-joins as an employee. In both the cases the Pension Contribution @8.33% is to be added to the Employer Share of PF. (Pension contribution is not to be diverted and total employer share goes to the PF). In these cases the pension contribution part will be added to employee share, EPF. In all other cases Pension Contribution is payable. A member joining after 50 years age, if not a pensioner does not have choice of not getting the Pension Contribution on grounds that he will not complete 10 years of eligible service. The social security cover is applicable till he/she is a member. For International Worker, higher wage ceiling of 15000/- is not applicable from 11-09-2010. Note:- In case an existing EPS member (as on 01-09-2014)whose Pension contribution was paid erstwhile EPS wage ceiling of 6500/- contribution to contribution above Rs 15000/- wage ceiling from 01-09-2014 he will have to give a fresh consent and an amount of 1.16% on wages above 15000/- will have to be contributed by him in pension Fund (A/C No 10) through the employer. 1. Contribution to be paid on up to maximum wage ceiling of 15000/- even if PF is paid on higher wages. 3. EDLI contribution to be paid even if member has crossed 58 years age and pension contribution is not payable. This is to be paid as long as the member is in service and PF is being paid. As on 31st March 1972, the enhanced rate of 8 per cent 'was applicable to the establishments employing 50 or more persons. As on 31st March 1991, the enhanced rate of 10 per cent 'was applicable to the establishments employing 50 or more persons. Notification dated 9th April, 1997 was issued enhancing Provident Fund contribution rate from 8.33% to 10%. With this 172 categories of industries/establishments out of 177 categories notified were to pay Provident Fund contribution @ 10% w.e.f. 1.5.1997. Total employers’ and employees’ contributions. Total employer’s and employees’ contributions payable @ 6.25%. Total employer’s and employees’ contributions payable @ 8%. On total pay on which contributions are payable. charges payable per month per establishment was Rs. 5/-. charges payable per month per establishment is Rs. 500/-. On total employees’ and employer’s contributions payable @ 6.25%. On total employees’ and employer’s contributions payable @ 8%. For 0 — 2 months delay – @ 5 % p.a. For 2 — 4 months delay – @10 % p.a. For 4 — 6 months delay – @ 15 % p.a. 2. Levy of damages at lesser rates is not permissible under the EPF & MP Act. 3. Reduction/Waiver of damages – considered only for Sick Industrial Companies having rehabilitation scheme sanctioned by BIFR. 4. Deposit dues in time – avoid penal damages. S.O. 827(E).—In exercise of the powers conferred by the Explanation to paragraph 30 read with paragraph 39 of the Employees' Provident Funds Scheme, 1952, and in supersession of the notification of the Government of India in the Ministry of Labour and Employment published in the Gazette of India, Extraordinary, Part II, Section 3, Sub-section (ii), vide number S.O. 323(E), dated the 2 February, 2015, except as respects things done or omitted to be done before such supersession, the Central Government, after consulting the Central Board and having regard to the resources of the Employees’ Provident Fund available for meeting its normal administrative expenses, hereby fixes the administrative charges payable by the employer for the purposes of paragraph 30 and sub-paragraph (1) of paragraph 38 of the said Scheme with effect from 1st April, 2017 at 0.65 per cent (zero point six five per cent.) of the pay as referred to in the said paragraphs subject to a minimum sum of seventy-five rupees per month for every non-functional establishment having no contributory member and five hundred rupees per month per establishment for other establishments. 2. For the removal of doubts, it is hereby notified that nothing contained in this notification shall affect the administrative charges payable in respect of the period up to and inclusive of the 31 March, 2017 in respect of which the notification referred to in paragraph 1 herein shall continue to apply as if the same had not been superseded. What would be the procedure if the employer has paid PF admin Charges at 0.85% for April 2017. Can it be adjusted now in Jan 2018? Is edli admin charges of 0.01% has waived off completely (in case of minimum Rs.200)..??? While preparing challan In a/c 2 I entered the wage but after generating the challan it was double.May I know why???? Sir, our establishment is closed wef 01.05.2007 and we are remitting only the minimum administration charges under A/c No's 2 & 22 every month. Being unaware that minimum administration charges under A/c No. 22 has been exempted wef Apr 2017, we have remitted the same from Apr 2017 to Dec 2018 (Total Rs. 525/-). Can we adjust this amount against future payments of minimum administration charges in A/c No. 2?